Zara Navy Quilted Puffer Coat With Fur hood SIZE M. Condition is Used. Beautiful navy blue coat with high collar. Super soft and comfy! New with tags. Size XS. Zara Womens Short quilted jacket with shimmer Size S. Quilted jacket with high neck, long sleeves, front piped pockets, metal eyelet detail with contrasting ribbons and contrasting lining. Fastens with zip and snap button on the front. Worn once .In excellent condition! 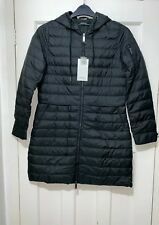 Zara Ladies Duck Down Puffer Jacket Coat M. Condition is Used. Dispatched with Royal Mail 2nd Class. Zara Woman’s Mustard Coat Size XS. Condition is Used. Dispatched by 2nd class post on same day as payment. 100% feedback, check my other items Will combine postage. Zara Black Coat Jacket with hidden hood size Small Excellent Condition Rrp £45. Condition is Used but only worn a couple of times so excellent condition!! Bargain!! Lovely coat. Dispatched with Royal Mail 2nd Class. ZARA PUFFER JACKET WITH HIGH COLLAR AND LONG SLEEVES WITH ADJUSTABLE ELASTIC CUFFS.FEATURING ZIP UP POCKETS AND A ZIP UP FRONT. Composition – 100% Nylon. Long sleeve jacket with a detachable hood and a zip-up front. Features side pockets with zip fastening and a carrying pouch for easy storage. Zipped cuffs and central zip fastening.SIZE L.
A great little jacket in green quilted with corduroy shoulders and ribbed sides and zip fronted pockets. There is a large zip down the front and poppers with a ribbed high neck collar and a silky lining in great condition. 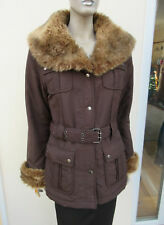 Zara Green Khaki Jacket Coat Size M - Size 8-12 Condition is used but excellent condition. Will post second class signed for. ZARA Black Quilted Fur Trim Belted Anorak Utility Jacket. Fur trim to the front, the collar and cuffs. Press stud fastening with belt. Press stud flap chest and hand pockets. ZARA HIP LENGTH PUFFER JACKET.HIGH COLLAR AND ELASTIC HEM AND CUFFS.INVISIBLE FRONT ZIP WITH SNAP HOOK AND EYE FASTENERS.FEATURES SIDE POCKETS,ZIP OFF HOOD WITH FUR TRIM.ZIPPED POCKETS ON THE SLEEVES. Zara Basic Ladies Womens Navy BLUE Coat Jacket Size Small . Zara Basic Ladies Womens Navy BLUE Coat Jacket Size Small.. Condition is Used, good condition a few slight marks on the interior. Dispatched with Royal Mail 2nd class. 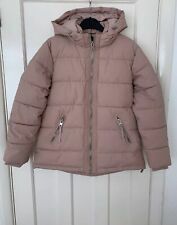 ZARA Women quilted puffer jacket coat XS ( size 8 ) hood fur collar White Condition is Used. Dispatched with Royal Mail 2nd Class. Long sleeve puffer jacket with a faux fur exterior. Featuring a raised collar, front welt pockets and a zip-up front. ZARA SHORT COAT WITH HIGH COLLAR AND FIXED HOOD.LONG SLEEVES WITH STRETCH CUFFS.ZIP AND HOOK AND EYE CLOSURE AT THE FRONT.ZIPPED SIDE POCKETS AND DRAWSTRING HOOD. Zipped cuffs and central zip fastening.SIZE S.
ZARA NAVY BLUE QUILTED PARKA COAT WITH REMOVABLE LINING WHICH CAN BE WEAR AS A SECOND JACKET. All our products are 100% original Zara.